Channel Islands National Marine Sanctuary is located off the coast of Santa Barbara and Ventura counties in Southern California, 350 miles south of San Francisco and 95 miles north of Los Angeles. The sanctuary was designated in 1980 because of its national significance as an area of exceptional natural beauty and resources; it is administered by the National Oceanic and Atmospheric Administration (NOAA), within the U.S. Department of Commerce. The sanctuary encompasses 1,470 square statute miles (1,110 square nautical miles) of water from mean high tide to 6 nautical miles offshore of Anacapa, San Miguel, Santa Barbara, Santa Cruz, and Santa Rosa Islands (Figure 1). The sanctuary is a special place for species, sensitive habitats, shipwrecks, and maritime archaeological artifacts. Many valuable commercial and recreational activities, such as fishing, shipping, and tourism occur in the sanctuary. A comprehensive ecosystem management approach is used to promote long-term conservation of sanctuary water, wildlife, habitats, and maritime archaeological resources, while allowing compatible human uses. Within the boundary of the sanctuary lies the Channel Islands National Park, a special terrestrial and marine protected area of national and global significance. It is administered by the National Park Service, a component of the Department of the Interior. The park consists of 250,000 acres of land and ocean environment encompassing Anacapa, San Miguel, Santa Barbara, Santa Cruz (Figure 2), and Santa Rosa Islands, their submerged lands, and the waters within one nautical mile of each island. Channel Islands National Park monitors and protects threatened and endangered species, restores ecosystems, and preserves the natural and cultural resources for current and future generations. The Channel Islands sanctuary is characterized by a unique combination of features including: complex oceanography, varied bathymetry, diverse habitats, remarkable biodiversity, rich maritime heritage, a remote yet accessible location, and relative lack of development (Figure 2). The combined physical, biological and cultural characteristics of the sanctuary provide outstanding opportunities for scientific research, education, recreation, and commerce. Such activities include commercial and recreational fisheries, marine wildlife viewing, sailing, boating, kayaking, and other recreational activities, maritime shipping, and nearby offshore oil and gas industry. The Channel Islands and the surrounding waters have a very rich history. 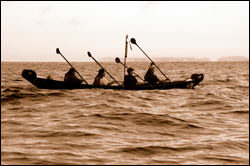 The Chumash, or island people, are the indigenous people of the Santa Barbara Channel and inhabited the Channel Islands and adjacent mainland dating back thousands of years. A vibrant Chumash community remains in Southern California today. Cultural resources found in the sanctuary represent Chumash Native American and other pre-European cultures and date to the end of the Pleistocene, approximately 13,000 years before present. This date is associated with the early human remains discovered at Arlington Springs on Santa Rosa Island (Johnson et al. 1999). Arlington Springs and Daisy Cave on San Miguel Island are two of the earliest archaeological sites in North America (Watts et al. 2008). Recent findings of additional early Holocene sites on San Miguel provide further evidence that the western Northern Channel Islands were a particularly attractive area for early Americans (Watts et al. 2008). For hundreds of years the Chumash traveled the Santa Barbara Channel in plank canoes called tomols to trade with the mainland community. Juan Rodriguez Cabrillo, believed to be a Portuguese navigator in service to Spain, entered the Santa Barbara Channel in 1542 and is believed to be the first European to land on the islands. Subsequent explorers included Sebastian Vizcaino, Gaspar de Portola, and English captain George Vancouver, who in 1793 assigned the present names of the islands on nautical charts. Beginning in the late 1700s and continuing into the 1800s, Russian, British, and American fur traders hunted sea otters for their valuable furs. Once the sea otters were hunted to near-extinction, traders focused their efforts on hunting seals and sea lions for their fur and oil. In 1912 the U.S. Lighthouse Service (later the U.S. Coast Guard) began its stay on Anacapa Island and in 1932 constructed the Anacapa Island lighthouse that exists to this day. The U.S. Navy assumed control of San Miguel Island just before World War II and subsequently the islands served an important role in Southern California's coastal defenses. Federal efforts to protect the islands began in 1938 when President Franklin D. Roosevelt proclaimed Santa Barbara and Anacapa islands as the Channel Islands National Monument. In 1976, a U.S. Navy and National Park Service agreement allowed supervised visitation of San Miguel Island. In 1978, continued protection, research, and educational use of the mostly privately owned Santa Cruz Island was granted through a partnership between the Nature Conservancy and the Santa Cruz Island Company. Anacapa, Santa Cruz, Santa Rosa, San Miguel, and Santa Barbara Islands, their submerged lands, and the waters within one nautical mile of each island were designated as the nation's 40th national park in 1980. Later that same year, the ocean waters surrounding six nautical miles out of the islands were designated as a national marine sanctuary. Since the days of the early coastal Chumash inhabitants, coastal waterways along Southern California have been a main route of travel and supply. Ocean-based commerce and industry (e.g., fisheries and coastal shipping) are important to the maritime history, the modern economy, and the social character of this region. The expansion of the global economy has resulted in a substantial increase in international vessel traffic through the Santa Barbara Channel. Much of this traffic is related to the Port of Long Beach-Los Angeles, the second busiest port in North America (Port of Long Beach 2005). The Channel Islands sanctuary is located about 70 miles northwest of the port and about 40 miles northwest of Port Hueneme, a smaller deepwater international port. 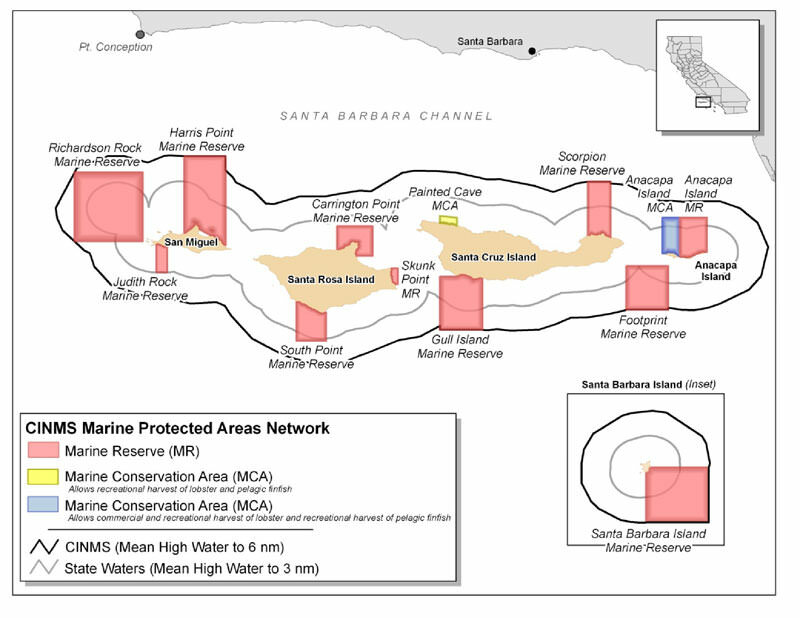 These ports generate extensive commercial shipping traffic that transits the Santa Barbara Channel using shipping lanes that pass through the sanctuary at its northeast boundary (Figure 4). Approximately 75 percent of the departing vessel traffic leaves northbound and 65 percent of arriving vessel traffic comes southbound, passing through the Santa Barbara Channel (U.S. Department of Commerce 2007). Regional oil and gas facilities represent another significant source of commercial vessel traffic near the sanctuary. 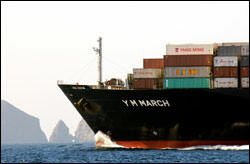 Combined, the total commercial vessel traffic in the Santa Barbara Channel in 2005 was over 7,000 vessels per year ( Santa Barbara County Air Pollution Control District 2006). Fishing is another important industry in the sanctuary. The waters surrounding the Channel Islands include rich fishing grounds that support important commercial and recreational fisheries. Key target species for commercial fishing in the Channel Islands sanctuary include squid, sea urchin, spiny lobster, prawn, nearshore and offshore finfishes (e.g., rockfishes and California sheephead), coastal pelagic species (e.g., anchovy, sardine and mackerel), flatfishes (e.g., California halibut, starry flounder and sanddabs), rock crab, and sea cucumber. Squid is California’s largest fishery by economic value and tonnage (CDFG 2005) and the urchin fishery landings from the Channel Islands were the highest in the state in 2005 (CDFG 2006). Recreational (sport) fishing is also very popular in the sanctuary. Recreational fisheries in the sanctuary access both nearshore and offshore areas, and target both bottom fish and pelagic fish species. Types of fish landed by recreational fishers include kelp bass, mackerel, California sheephead, halfmoon, and ocean whitefish. Species commonly targeted by consumptive divers include many rockfish species, kelp bass, halibut, yellowtail and white seabass, as well as lobster and rock scallops. Offshore recreational fishing focuses on mobile species such as yellowtail, tuna, white seabass, barracuda, broadbill swordfish, marlin, and mako shark. Fish and fishers are not alone in seeking out the productive waters of the sanctuary. 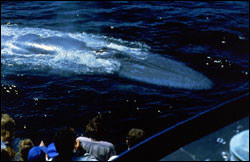 The waters surrounding the Channel Islands are a destination feeding ground for seabirds, pinnipeds, and a variety of cetaceans including humpback and blue whales (Figure 5). 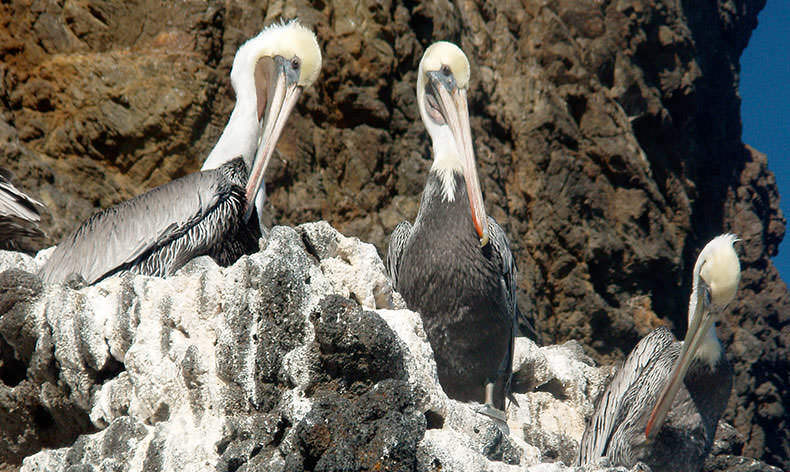 Foraging wildlife frequent sanctuary waters, and many charter vessels from Ventura and Santa Barbara make regular wildlife viewing trips to the sanctuary. Other popular non-consumptive recreational activities occurring in the sanctuary include snorkeling, diving, boating (motor and sailing), kayaking, swimming, and wildlife and scenic viewing. The Channel Islands are located within a unique geological region off the Southern California Coast. Over millions of years, large plates of the earth's crust moved along fault lines, pushing against the coastline of Mexico and California, creating the coastal geography that is seen today. During this shifting, part of the Southern California coast was rotated, resulting in the unusual east-west axis of the California coast just south of Point Conception, termed the Transverse Ranges, and the formation of the Channel Island chain along this coast. The Continental Borderland is the offshore section of the underwater geology that forms a wide continental shelf (Norris and Webb 1990). Unlike most wide continental shelves that consist of gently sloping platforms interrupted by low banks and occasional canyons, the Continental Borderland is a region of basins and elevated ridges (Norris and Webb 1990) (Figure 6). The Channel Islands are the portions of the ridges that rise above sea level. 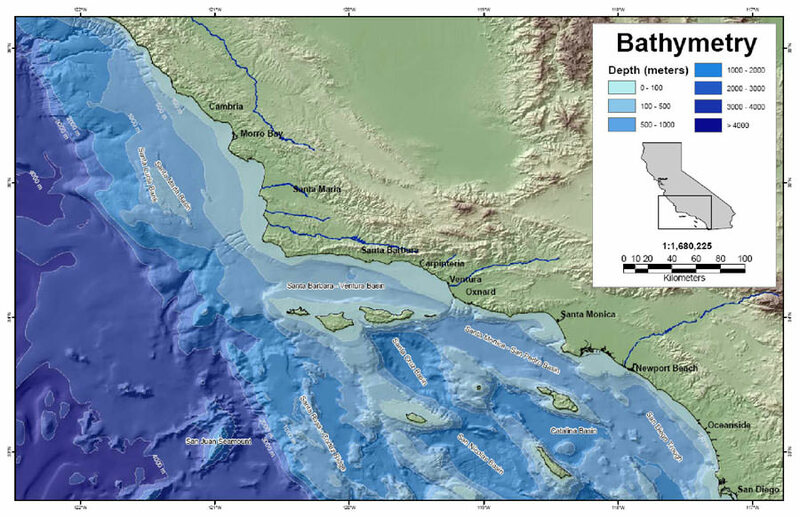 The Santa Barbara Basin is a deep (1650 feet, 500 meters) submerged geological feature within the Santa Barbara Channel (the body of water between the islands and the mainland). More than 20 oil fields and several natural gas fields lie beneath the Santa Barbara Channel in the Santa Barbara Basin. Natural oil seeps in the area are known to have one of the highest rates of seepage in the world. For example, seeps at Coal Oil Point near Santa Barbara are estimated to discharge approximately 150-170 barrels (6,300-7140 gallons) of oil per day (Hornafius et al. 1999). Water circulation around the Channel Islands is complex and highly dynamic, resulting from the interaction of large-scale ocean currents, local geography, and the unique basin and ridge topography of the ocean bottom in the Southern California Bight. The major ocean current moving through the area is the south-flowing California Current, which brings cold water from the Gulf of Alaska down the coast of California. This current generally flows at the western edge of the islands (Hendershot and Winant 1996). As it flows south towards the equator, it mixes with the north-flowing Southern California Countercurrent, which brings warm water northwestward up the coast (Hendershott and Winant 1996). Between the islands and the mainland these currents create a localized cyclonic gyre that can vary in intensity seasonally based on current and wind speed (Hendershot and Winant 1996, Harms and Winant 1998, Winant et al. 2003). These varying conditions create alternate states of upwelling, where cool nutrient-rich water is brought from deeper areas to the photic zone at the surface, and relaxation, when upwelling ceases (Winant et al. 2003). Regional upwelling is wind-driven and provides the nutrients and conditions for seaweeds, phytoplankton, and zooplankton to thrive, with effects seen throughout the food chain. There are a wide variety of important habitats within the Channel Islands sanctuary including intertidal, hard and soft bottom subtidal, deep water, water column, kelp forest, eelgrass, and surf grass. Each of these habitats supports a diverse group of invertebrates, fish, algae, and plants. Intertidal zones are composed of a variety of coastal habitats that are periodically covered and uncovered by waves and tides. Therefore, these habitats vary in the type of substrate and degree of exposure to surf. The vertical extent of the tidal change within the Channel Islands can be as much as 10 feet (3 meters). Bottom types in the intertidal zones include fine muds, sand, gravel, cobble, boulders, and bedrock. Sedentary and mobile invertebrates, fish, algae, seabirds, and pinnipeds use the intertidal zone surrounding the Channel Islands. Subtidal habitats around the islands include those ranging from the lower limit of the intertidal zone down to deepwater offshore. Nearshore subtidal habitats include mud, sand, gravel, cobble, and bedrock substrates. These shallow-water habitats are subject to dynamic physical processes, including wave exposures, along-shore currents, upwelling, temperature, salinity, and nutrient differentials, and suspended sediment loads. 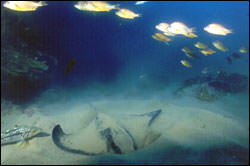 Soft bottom habitats are extensive in the sanctuary, especially in deeper water. These habitats support a community living above the sand, including sea pens, sand crabs, sand dollars, sand stars, bottom-dwelling sharks, rays, and flatfishes (Figure 7). In addition, a diverse assemblage also dwells within the soft sediment, including worms, crustaceans, snails, and clams. Rocky subtidal habitats are widespread around the sanctuary, and include high-relief volcanic reefs with walls, ledges, caves, and pinnacles. Low-relief sedimentary reefs exist as well. These rocky subtidal environments are capable of supporting thousands of algal, invertebrate, and fish species, depending on the extent of habitat heterogeneity and influence of physical factors such as turbulence, currents, light, temperature, nutrients, sedimentation, and biological interactions such as competition and predation. The deep water habitats around the Channel Islands extend from 30 to greater than 200 meters deep over the continental shelf and slope and well over 1000 meters in canyons. Well over 90 percent of deepwater benthic habitats in the Southern California Bight consist of soft bottom habitat (Thompson et al. 1993). Most of the deepwater hard bottom substrates are low-relief reefs less than 1 meter in height; some reefs have 1- to 5-meter-high features. Boulders and bedrock outcroppings are features of these reefs in the deep waters around the Channel Islands. 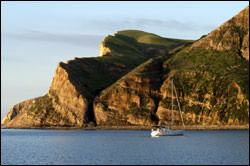 Higher relief pinnacles and ridges occur in some areas such as off the northwest end of San Miguel Island. Because of the difficulty in studying very deep habitats, little is known about these areas in the Channel Islands sanctuary. However, recent submersible studies have revealed deep sea corals, including a new species, and associated diverse fish and invertebrate communities (Tissot et al. 2006). Pelagic habitat includes the offshore oceanic water around the islands. This is the most extensive habitat in the sanctuary and is divided into subhabitats based on depth, each of which has varying degrees of light penetration, temperature, oxygen concentration, and density. A variety of animals occupy the pelagic habitat. Phytoplankton and other pelagic organisms occupy the epipelagic zone (0-200 meters) which includes the photic (light penetrating) zone. Large migratory fish and marine mammals occupy the mesoplagic zone, from 200 to 1000m (U.S. Department of Commerce 2007) and their wide ranges and long distance migrations make them difficult to study. Macroalgae and marine plants (seagrasses) are habitat-forming organisms that grow in intertidal and shallow subtidal waters, generally less than 30 meters deep, where enough light penetrates for photosynthesis. 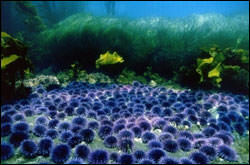 The islands support a rich array of benthic macroalgae and seagrasses. In the Southern California Bight, there are at least 492 species of algae and four species of seagrasses known to occur of the 673 species described for California (Abbott and Hollensberg 1976, Murray and Bray 1993). These algae and marine plants are critical to the life history of many of the invertebrates, fishes, seabirds, and marine mammals found in the sanctuary. Giant kelp (Macrocystis pyrifera) forms extensive underwater forests on rocky substrates at shallow subtidal depths (Figure 8). 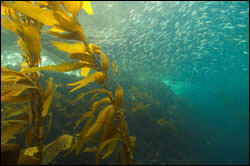 These impressive kelp forests are characteristic features of Southern California nearshore marine environments, including the sanctuary, and are important not only ecologically, but also for recreational and commercial activities including fishing, diving, and tourism. Kelp beds are highly productive habitats and serve as important nursery habitat for juvenile fishes in the upper canopy (Carr 1994), as well as providing food, attachment sites, and shelter for a diverse assemblage of invertebrates and other species of algae on the benthos through the water column and in the root-like structure called the hold fast (Dayton 1985, Graham 2004). The two types of marine flowering plants found in the sanctuary form dense beds on different substrate and in different conditions. Surfgrass (Phyllospadix sp. ), found in rocky intertidal and shallow subtidal areas, and eelgrass (Zostera marina), found in soft bottom subtidal areas, form productive and complex habitats that provide food and refuge for a wide variety of marine species, including fish and invertebrates that are recreationally and commercially fished (den Hartog 1970, Orth et al. 1984, Hemminga and Duarte 2000) (Figure 9). Seagrass beds provide nursery habitat (reviewed in Heck et al. 2003) and are important for nutrient cycling (Costanza et al. 1997) and substrate stabilization (Fonseca and Fisher 1986). The abundance and distribution of living resources in the sanctuary is driven on a large scale by the oceanographic conditions around the islands, specifically the mixing of the warm northerly current and the cooler southerly current and localized gyres. The Channel Islands are transitional; the islands have a gradient of southern versus northern species. Santa Barbara Island, the most southern island, is inhabited mainly by southern species, Anacapa and Santa Cruz Islands are intermediate with both southern and northern components, while Santa Rosa and San Miguel Islands to the north are populated with a greater portion of northern species. For example, garibaldi (Hypsypops rubicunda) is found mainly in warm water regions while blue rockfish (Sebastes mystinus) are more abundant in the colder water regions. The varied oceanographic conditions and the transition between them, the diversity of habitats, ranging from sheltered embayments to exposed open coasts, and the relatively undisturbed location support a wide variety of invertebrates, fish, macroalgae, marine plants, marine mammals, and seabirds. At the base of the food web in the Southern California Bight is a diverse planktonic community. The abundance and species richness of plankton varies greatly both spatially and temporally and is dependent upon such environmental factors as nutrients and temperature. Short-term blooms of phytoplankton often occur in association with upwelling events and subsequently support zooplankton populations. Zooplankton, in turn, are preyed upon by small schooling fish, which support larger fish and marine mammals, including pelagic migratory species. The total number of benthic invertebrate species in the Southern California Bight may be in excess of 5,000, not including microinvertebrates (Smith and Carlton 1975, Straughan and Klink 1980). Select invertebrates in the sanctuary include multiple species of corals, prawns, spiny lobster (Figure 10), crabs, sea urchins (Figure 11), sea cucumbers, sea stars, abalone, nudibranchs, scallops, mussels, squid, clams, barnacles, snails, salps, tunicates, jellyfish, sea slugs, worms, and anemones. 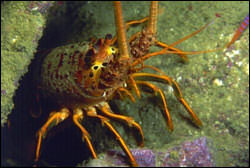 Species that deserve special consideration because of their importance as keystone dominants, harvested species, or species particularly sensitive to environmental disturbance include: California hydrocoral (Stylaster californicus); ridgeback prawn (Sicyonia ingentis); spot prawn (Pandalus platyceros); spiny lobster (Panulirus argus); rock crab (Cancer antennarius) (brown, yellow and red); abalone (black (Haliotis cracherodii), green (H. fulgens), pink (H. corrugate), red (H. rufescens), white (H. sorenseni), flat (H. walallensis), northern (threaded (H. assimilis)) (Geiger 1999); mussels; clams; scallops; market squid; sea urchins (red (Stronglyocentrotus franciscanus), purple (S. purpuratus), and white (Lytechinus anamesus)); sea cucumbers (Holothuroidea); and sea stars (Leet et al. 2001). Several of these species are harvested commercially, and represent significant fisheries in the Southern California Bight. More than 400 species of fish have been documented in the sanctuary, a greater species richness than at nearby coastal regions of the Southern California mainland. Fish diversity on nearshore reefs is related to the presence or absence of kelp and substrate topography. 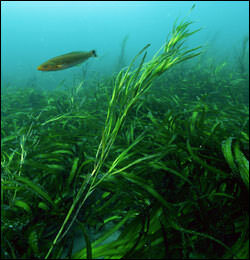 Hard substrate is the least common habitat type in the Channel Islands, but it is among the most important fish habitat because it supports kelp. Some of the common nearshore epipelagic fishes in the sanctuary include the California barracuda (Sphyraena argentea), Pacific bonito (Sarda chiliensis), white seabass (Atractoscion nobilis) and yellowtail (Sebastes flavidus). Common groundfish found within sanctuary include bocaccio (Sebastes paucispinis), cowcod (S. levis), chilipepper (S. goodie), widow rockfish (S. entomelas), bank rockfish (S. rufus), dover sole (Solea solea), English sole (Pleuronectes vetulus), and sablefish (Anoplopoma fimbria). Coastal pelagics and highly migratory species include Pacific sardine (Sardinops sagax), Northern anchovy (Engraulis mordax), Pacific mackerel (Scomber japonicas), jack mackerel (Trachurus symmetricus), albacore (Thunnus alalunga), swordfish (Xiphias gladius), Pacific northern bluefin tuna (T. orientalis), skipjack tuna (Katsuwonus pelamis), yellowfin tuna (T. albacores), striped marlin (Tetrapturus audax), shortfin mako shark (Isurus oxyrinchus), thresher shark (Alopias vulpinus), blue shark (Prionace glauca) and opah (Lampris regius). The Channel Islands sanctuary is located along the Pacific Flyway, a major migratory route for birds, and acts as a stopover during both north (April through May) and south (September through December) migrations. In addition, the diversity of habitats on the Channel Islands provide breeding and nesting sites for many species and large numbers of seabirds, which then forage in sanctuary waters. Sandy beaches provide foraging and resting habitat for a number of shorebirds including Black-Bellied Plover (Pluvialis squatarola), Willet (Catoptrophorus semipalmatus), Whimbrel (Numenius phaeopus), Long-billed Curlew (N. americanus), gulls, and sanderlings (Calidris alba). The upland portions of the beach provide kelp deposits that attract invertebrates where Black and Ruddy Turnstones (Arenaria melanocephala and A. interpres), dowitchers, and other shorebird species forage. Caves and crevices provide nest habitat for Xantus’s Murrelets (Synthliboramphus hypoleucus) and Ashy Storm-Petrels (Oceanodroma homochroa), while Cassin’s Auklets (Ptychoramphus aleuticus) dig burrows in seaside cliffs. Nineteen seabird species breed in the Channel Islands, eight of which have been granted special status under federal or California state law: Ashy Storm-Petrel, Black Storm-Petrel (O. melania), California Brown Pelican (Pelecanus occidentalis), California Least Tern (Sternula antillarumi), Double-crested Cormorant (Phalacrocorax auritus), Rhinoceros Auklet (Cerorhinca monocerata), Western Snowy Plover (Charadrius alexandrinus), and Xantus’s Murrelet (Synthliboramphus hypoleucus). Four species of sea turtles have been reported in the offshore Southern California region: green (Chelonia mydas), loggerhead (Caretta caretta), olive-Ridley (Lepidochelys olivacea) and leatherback (Dermochelys coriacea). All species of sea turtles are federally endangered and these four species are rarely sighted at the Channel Islands because of range limits, decreased populations, and their highly migratory and pelagic habits. The Channel Islands and surrounding waters support a great diversity of marine mammals, including whales, pinnipeds, and otters. As in the case of the seabirds, because of their dependence on a large volume of seasonal food resources, the abundance and distribution of marine mammals is an indication of the general heath and ecological integrity of the marine ecosystems of the Channel Islands sanctuary. 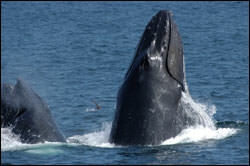 At least 33 species of cetaceans have been reported in sanctuary waters (Leatherwood et al. 1982, Leatherwood et al. 1987). Common cetaceans include: short-beaked (Delphinus delphis) and long-beaked common (Delphinus capensis), bottlenose (Tursiops truncatus), Pacific white-sided (Lagenorhynchus obliquidens), and Risso’s dolphins (Grampus griseus); and California gray (Eschrichtius robustus), blue (Balaenoptera musculus), and humpback (Megaptera novaeangliae) whales (Figure 12). The sanctuary provides vital habitat for pinnipeds, offering important feeding areas, breeding sites, and haul outs. Six species of pinnipeds have historically occurred in the Northern Channel Islands: northern fur seal (Callorhinus ursinus), Guadalupe fur seal (Arctocephalus townsendi), northern elephant seals (Mirounga angustirostris), Pacific harbor seal (Phoca vitulina), Steller sea lion (Eumetopias jubatus), and California sea lion (Zalophus californianus). The most common pinniped in the northern Channel Islands is the California sea lion and the least common is the Steller sea lion, which has declined throughout its range and is now extremely rare throughout Southern California. Finally, the southern sea otter (Enhydra lutris) also can be found in the Channel Islands. The southern sea otter is listed as threatened under the federal Endangered Species Act and is considered depleted and protected under the Marine Mammal Protection Act. In general, the California population has been slowly increasing in recent years. There are many documented shipwrecks in the waters of the Channel Islands National Marine Sanctuary such as the passenger steamer Cuba, which stranded off of San Miguel Island in 1923, and the California Gold Rush passenger steamer Winfield Scott, which stranded in 1853 on Anacapa Island and is listed in the National Register of Historic Places (Figure 13). The significant number of shipwrecks within the sanctuary can largely be attributed to prevailing currents and weather conditions, combined with natural hazards. The shipwreck remains reflect the diverse range of activities and nationalities that traversed the Santa Barbara Channel. European sailing and steam vessels, California-built ships of Chinese design called “junks,” American coastal traders, vessels engaged in island commerce, and a Gold-Rush-era side-wheel steamer have all been lost in sanctuary waters. Each has a story to tell about the history, technology, and society of earlier times. Between the years 1853 to 1980, an inventory of over 140 historic ship and aircraft wrecks were documented in the Channel Islands National Marine Sanctuary and National Park. To date, about 30 sites have been located and surveyed. 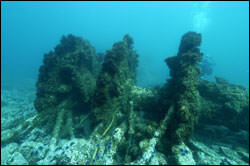 The Sanctuary’s Shipwreck Reconnaissance Program contributes to scientific knowledge and enhancement of management practices related to underwater archaeological resources by encouraging research and monitoring efforts. Federally certified scuba divers provide year-round monitoring of submerged sites through cooperative partnerships with the Channel Islands National Park, California State Lands Commission and Coastal Maritime Archaeology Resource organization.